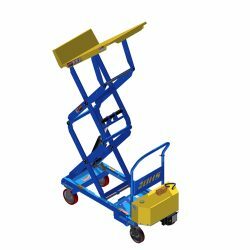 Mobile Tilt Tables provide ergonomic work positioning anywhere in the facility, even in applications that do not allow for regular forklift use. These work positioners are entirely self-contained units with smooth-rolling swivel casters, an adjustable, pivoting pull-handle, and hydraulic-powered forks. The result is a portable unit that moves like a lightweight manual pallet jack but repositions skids, boxes, and other bulk-material containers like a stationary Tilt Table — up to 90 degrees forward. Find out more about Mobile Tilt Tables and other ergonomic solutions by calling the BHS sales team at +1 314 423 2075. Ergonomic work positioning for heavy loads. Hydraulic tilting with an integrated foot pump. Positions skids with a closed hydraulic circuit. 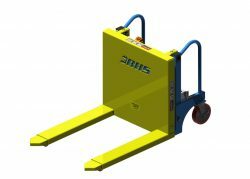 Lifts and tilts skids without the need for forklifts. Ergonomists — scientists who study the match between work and the worker — are unequivocal about the dangers of awkward postures: They are the main risk factor for musculoskeletal injuries when work surfaces are not properly positioned. Reaching and stretching to complete work requires the body to exert more force. That extra force leads to muscle fatigue, which drastically increases the risk of an overuse injury. The act of bending to reach into cartons, or of reaching for an item at the far end of a skid, places undue stress on the lower back. Repetition of these motions can lead to debilitating injury. The solution is to invest in work-positioning equipment that matches the job. Mobile Tilt Tables from BHS are designed to bring work to the worker, eliminating dangerous movements. Manual models tilt boxes toward the operator via hydraulic foot-pump, allowing for easy, stress-free positioning. Powered options accomplish the same task with a button mounted on a hand pendant with an 8-foot cable. All models are designed to roll smoothly through facilities, with heavy-duty swiveling casters. This portability allows operators to position the units precisely where they need them, bringing a powerful work-positioner to every station and every job. To find the right Mobile Tilt Table for your application, start with the bulk containers involved in the task. Boxes and skids require different solutions; this is why a combination of Mobile Tilt Tables and Skid Tilters offers facilities the most flexibility for portable work positioning. 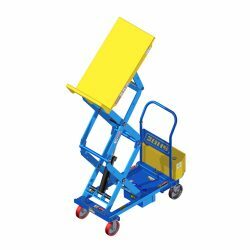 Tilt Tables lift and position bulk boxes and crates on a reliable formed-steel tilt top with a powder-coat finish that resists chemicals and abrasion. Skid Tilters, by contrast, are fitted with steel forks, allowing users to position the unit beneath a loaded skid to lift and tilt the load. With the load in place, both products provide the same ergonomic benefits, progressively bringing loads closer to staff without the need for bending or reaching. Powered units include multiple layers of safety protection, including thermal overload sensors and velocity fuses which freeze lift cylinders in the unlikely event of a rupture. 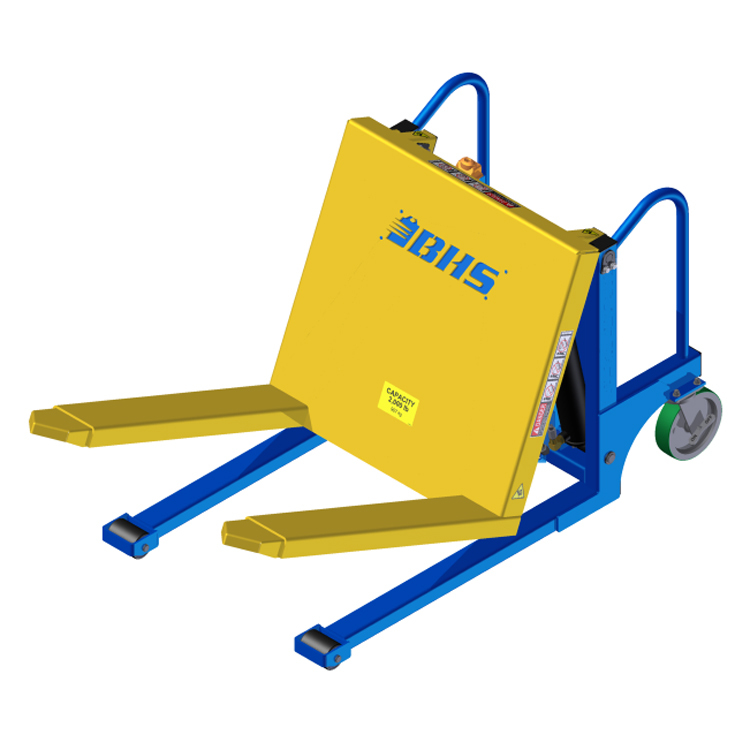 All models feature foot protectors around casters and a quick-engaging brake that keeps the unit secure during use. To learn more about ergonomic work-positioning equipment from BHS, click on any of the product categories above. To purchase Mobile Tilt Tables from BHS, call our sales team at +1 314 423 2075 for information about local dealers.